The championship softball team from Saturday's Family Day tournament poses with their trophy shirts. 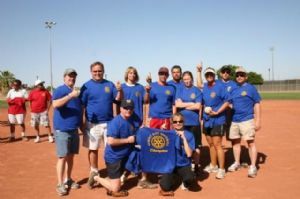 Saturday's Rotary Family Fun Day at Cibola High School was a great success, even with the small number that turned out. Those that attended participated in a best two out of three game softball tournament, which saw some spills and thrills, some great catches, some near home runs and plenty of fun for all. There were delicious burgers, hot dogs, chips, salads, cakes, and soft drinks. The best part was, it was not only fun for all, it was FREE for all.